Sassy Goat Milk Conditioning Shaving Soap is 100% pure and natural, handmade with farm fresh raw goat milk from my own herd of LaMancha dairy goats. Sassy Goat Milk Soap makes shaving soaps that lather well and that are naturally high in antioxidants and helps moisturize your skin with absolutely the best ingredients for natural skin care. Sassy Goat Milk Shaving Soap is pure and fresh, containing absolutely no harmful ingredients, phthalates, parabans, preservatives or fillers and is gentle for even the driest and most sensitive skin. Sassy Goat Shaving Soaps contain fresh goat milk hand milked from my own herd of LaMancha goats and saponified olive oil, coconut oil (for a great lather) and castor oil, shea butter, cocoa butter, mango butter, and bentonite clay. • Sassy Goat Conditioning Shaving Soap with Calming Lavender also contains pure essential oil of lavender. 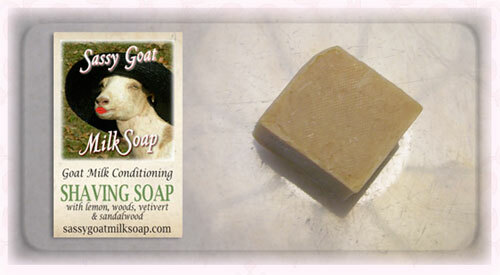 • Sassy Goat Conditioning Shaving Soap Vintage Scent also contains essential lemon, woods, vetivert and sandalwood oils. My shaving bar weighs approximately 3 ounces. Sassy Goat Milk Conditioning Shaving Soaps are shaped to fit into your existing shaving mug and are formulated to create a super lathered shave when used with a boar bristle brush. If you are using a shaving brush it will help in actually raising up the hairs on your face. When hairs are raised (as opposed to matted or pressed down on your skin) – the razor blade will have a much easier time cutting the actual hair since it will be standing on edge, thus not requiring you to press firmly. This means that when its easier for the razor blade to cut through the hair, there will be a lot less irritation for your skin resulting in a reduction in razor burn, bumps, etc. Our Shaving Brushes are made of 100% Boar Bristles for a smooth, close shave.